Kim Rak-gyom, the commander of the Korean People’s Army (KPA) Strategic Rocket Force Command, was promoted to colonel general at the order of the country’s current leader Kim Jong-un, the Korean Central News Agency (KCNA) reported late Saturday, according to AFP news agency. The unit is in charge of the country’s mid- and long-range missiles programme. Dozens of other senior military officials were also promoted to the rank of lieutenant general and major general, the KCNA said. The latest round of military promotions – often announced on key political anniversaries – came as the North celebrated Jong-Il’s birthday on Sunday. “Everybody, let’s rally around the party centre led by the great leader Kim Jong-un and robustly fight… to complete the revolution!” the ceremonial head of state Kim Yong-Nam said in a speech as thousands of party and military officials convened in the capital Pyongyang to pledge loyalty to Jong-un, television footage showed. The country marks the birthdays of both late leaders – Jong-il’s on February 16 and his father Kim Il-sung’s on April 15 – as major national holidays. South Korea and the US have announced that their annual military drills will take place from 24 February to 18 April, despite anger from North Korea. Pyongyang warned against the planned drills last week, calling them “exercises of war”. Meanwhile, the US said it was disappointed that the North rescinded an invitation to a US envoy to discuss the release of a jailed US citizen. 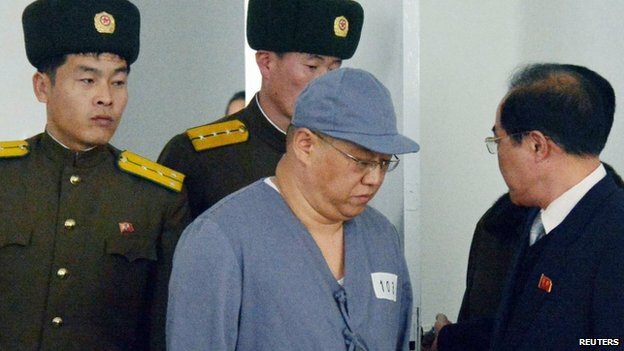 Kenneth Bae has been held in North Korea for more than a year. In a statement on Monday, the joint Combined Forces Command (CFC) said that Key Resolve, a computer-based simulation, and Foal Eagle, which involves air, ground and naval drills, were both scheduled to begin on 24 February. “Key Resolve is a vital exercise to strengthen readiness of the Republic of Korea and US Alliance,” CFC commander Gen Curtis Scaparrotti said. North Korea’s top military body threatened last week to cancel planned family reunions with the South if the joint military exercises went ahead. The reunions are for family members separated when the Korean peninsula was partitioned at the end of the 1950-53 Korean War. However, the North has been accused of using them as a bargaining chip. Separately, on Sunday, the US said it was “deeply disappointed” North Korea had decided to withdraw its invitation to US envoy Robert King for talks on jailed US citizen Kenneth Bae. The military exercises were “in no way linked to Mr Bae’s case”, State Department spokeswoman Jen Psaki said. “We again call on the DPRK [North Korea] to grant Bae special amnesty and immediate release as a humanitarian gesture,” she added. North Korea also cancelled a request from Mr King to visit last August to discuss Mr Bae. US civil rights leader Jesse Jackson has offered to travel to North Korea for talks instead, Ms Psaki said. Mr Bae, a Korean-American, was arrested in North Korea in November 2012. Pyongyang said he used his tourism business to form groups to overthrow the government, and sentenced to 15 years’ hard labour in May. Mr Bae is currently believed to be in a labour camp. His family say he has several health complaints including diabetes and liver problems. (CNN) — American Kenneth Bae, who is being held in North Korea, has been moved from a hospital to a labor camp, the State Department said on Friday. Agency spokeswoman Jen Psaki said in a statement that the United States was “deeply concerned” by the development. “We also remain gravely concerned about Mr. Bae’s health” and again urged Pyongyang to grant him “special amnesty and immediate release on humanitarian grounds,” she said. Bae, of Lynwood, Washington, was arrested in November 2012 in Rason, along North Korea’s northeastern coast. A devout Christian and father of three operated a China-based company specializing in tours of North Korea, according to his family and freekennow.com, a website that friends set up to promote his release. Last month, he told reporters that he had committed a “serious crime” in the secretive nation and that he had not experienced abusive treatment by the regime. Any statement by Bae in captivity would be sanctioned by the North Korean government.